Excellent stone surface, unsurpassed smoothness and fine detail! Fast set has a 30-45 second mix time and a 1 minute 30 second working time. Stone models may be separated after 30 minutes. 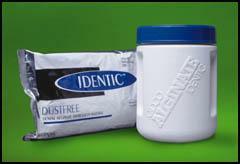 Easy mixing full strength alginate, dust-free, anti-microbial and pleasant tasting. Packaged in 1lb. poly-aluminum pouches to increase shelf life. (Cinnamon scented).